THE HAGUE, Holland, Oct, 26 (UP)–Sir Henry Deterding intends to resign as director general of the Royal Dutch Petroleum company, it was announced Monday. He will be succeeded by Dr. J.E.F. De Kok, now managing director of the Batavia Petroleum company. Sir Henri, who retains his seat on the board, is 70, Dutch born and a naturalised Englishman. The Hague , October 23 . 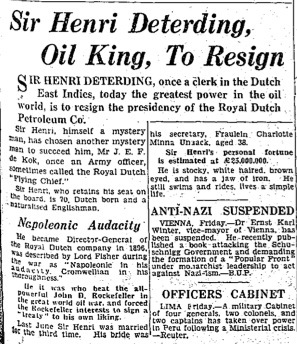 —Sir Henri Deterding, the oil magnate, will, it is understood, resign from his position as Director-General of the Royal Dutch Petroleum Company at the end of the year. He will be succeeded by Dr de Kok, Director at the Hague, who will continue to have his headquarters here.